I just threw everything in really, and so these quantities are what I suspect I used. Feel free to adjust them to your own taste. 1. Cooked the pasta and drain it well. Put to one side. 2. If you haven't already, steam the salmon until nicely cooked. Then remove the flesh from the skin and flake it. 3. Make a roux. Melt the butter in a medium sized saucepan. 4. Mix in the flour until well blended, then heat gently for a couple of minutes. 5. Take the pan off the heat and add the milk a small bit at a time, whisking each time until it is smooth. 6. When all the milk is added, return the pan to the heat and slowly bring the mix to the boil, whisking almost constantly to stop lumps forming. 7. Add salt and pepper to the white sauce to taste. 8. In a frying pan fry the onions and mushrooms (chopped small) until they are nicely cooked and soft. 9. Add in the salmon, English mustard and spinach. Fry for another 2 minutes. 10. 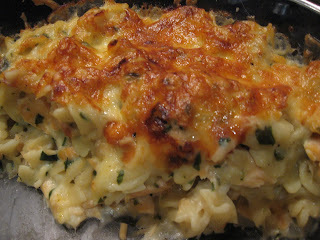 In a large bowl mix the white sauce, the salmon and onion mix and the pasta all together. Adding salt and pepper to taste. 11. Put the whole lot into an overproof dish. Grate the cheese all over the top. Grind a little pepper over the top too. 12. Bake in an oven at 175C for 30 minutes, or until the cheese has changed colour but not burnt !